The Society of Civil War Historians is soliciting nominations for the Tom Watson Brown Book Prize for books published in 2011. All genres of scholarship on the causes, conduct, and effects, broadly defined, of the Civil War are eligible. This includes, but is not exclusive to, monographs, synthetic works presenting original interpretations, and biographies. Works of fiction, poetry, anthologies, and textbooks will not be considered. Jurors will consider nominated works’ scholarly and literary merit as well as the extent to which they make original contributions to our understanding of the period. Elizabeth R. Varon, Professor of History at the University of Virginia, will chair the prize jury. The other members are Daniel E. Sutherland, Distinguished Professor of History at the University of Arkansas, and J. Matthew Gallman, Professor of History at the University of Florida. Tad Brown, President of the Watson-Brown Foundation, Inc., will serve as a non-voting member of the jury. Publishers are asked to send nominated books (only those published in 2011 will be considered) directly to the four jurors no later than January 31, 2012. The winner will be announced by August 1, 2012. The award will be presented at the SCWH banquet at the Southern Historical Association meeting, where the winner will deliver a formal address that will be published in a subsequent issue of the Journal of the Civil War Era. Of course, I could nominate any number of studies that fulfill the requirements included in the prize description, but I am going to limit it to just one. 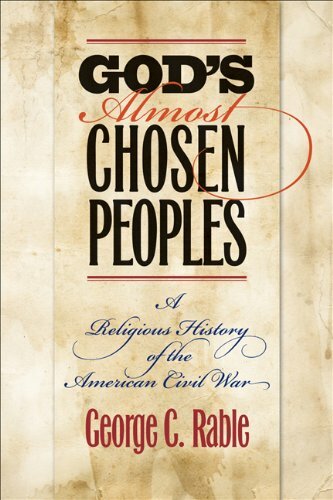 My nomination is George Rable’s, God’s Almost Chosen Peoples: A Religious History of the American Civil War . I suspect that this book will make the short list for most people and that makes two books by UNC Press that are likely to win back to back prizes. That is a testament to the top-notch editorial work of Gary Gallagher. So, which book do you think deserves to win?